Sambucol Original is a natural product made of blackberry ( Sambucus nigra L. ), Which is produced in central Europe. Black elderberries contain some of the strongest antioxidants found in nature, and the berries can be used throughout the year as a support for a normal immune system. 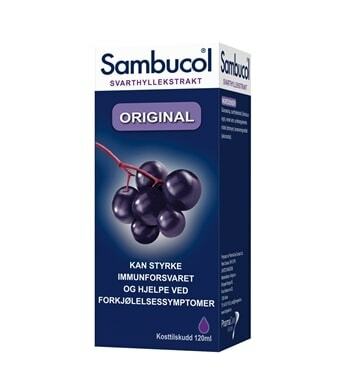 Sambucol Original er et naturprodukt fremstilt av svarthyll (Sambucus nigra L.). Produktet kan styrke immunforsvaret og hjelpe ved forkjølelsesymptomer. Tørt og kjølig med tett kork. Oppbevares utilgjengelig for barn.